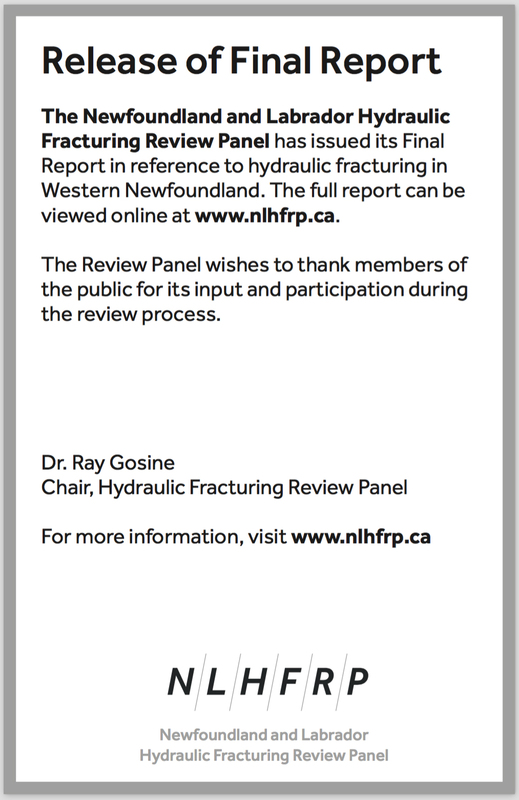 A review of current regulatory process in Newfoundland and Labrador respecting hydraulic fracturing operations and identifying needed changes consistent with other jurisdictions and best practices. As the review is undertaken, it would also be useful for the Panel to be mindful of existing provisions within the Environmental Protection Act that state that the purpose of environmental assessment is to “protect the environment and quality of life of the people of the province; and facilitate the wise management of the natural resources of the province”. It requires anyone who plans a project that could have a significant effect on the natural, social or economic environment to present the project for examination, including dissemination of project information for public comment. Using the information gathered from the processes noted above, the Panel shall prepare a report at the end of the review which will include a description of the Panel review process, the rationale, conclusions and recommendations of the Panel. The report will also provide a summary and analysis of comments from the public, stakeholders and communities. Formal submissions to the Panel will be made available for public review. 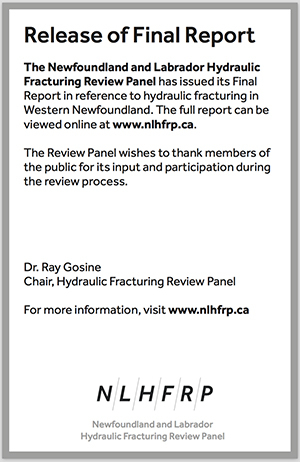 The Panel shall also provide conclusions on the environmental and socio-economic significance of hydraulic fracturing in oil and gas operations (exploration and production) in Western Newfoundland. In addition, the Panel report may provide recommendations relating to the appropriate practices and procedures regarding potential hydraulic fracturing operations in the province should the Panel recommend proceeding with hydraulic fracturing. Once completed, the Panel report will be submitted to the Minister of Natural Resources and will be made available to the public. The Minister of Natural Resources will appoint members to the Panel, including the chairperson. The Panel will be comprised of members chosen from outside the public service and shall have knowledge or experience relevant to hydraulic fracturing operations and/or the potential impacts thereof. In the event that a Panel member resigns or is unable to continue to fulfill their duties as a Panel member, the remaining members shall constitute the Panel unless the Minister determines otherwise. In such circumstances the Minister may choose to replace the panel member. The risk of water contamination, particularly groundwater, is one of the biggest concerns raised by the public with respect to hydraulic fracturing. Two key areas to address are the potential effects of hydraulic fracturing on groundwater and on surface water. The Panel will assess the short and long-term risks to groundwater and water wells. This may include such activities as water acquisition, additives mixing, well injection, flowback/produced water and wastewater management. What are the possible short-term and long-term risks to groundwater and water wells resulting from hydraulic fracturing activities? What actions/regulations/best practices can be applied to hydraulic fracturing activities to reduce potential risks? The Panel will assess the use of surface water for hydraulic fracturing operations. This assessment will include an assessment of the quantity of water required for exploration and operations, and the effect on water sources in the areas where exploration and development activities could take place. The Panel will also assess the sourcing of fresh water alternatives and recycling of water for use in hydraulic fracturing operations. The Panel should also assess the potential impact of surface water use on other users. What are the sources of water and volumes required for hydraulic fracturing activities? What are the potential risks to surface water sources and other users of these water sources? Are there adequate sources of water in Western Newfoundland regions where hydraulic fracturing activities may take place? What actions/regulations/best practices can be applied to hydraulic fracturing activities to reduce risks to surface water? Environmental protection measures are in place for the province’s oil and gas industry. While there is no recommendation at this time to allow hydraulic fracturing operations to occur in the province, it is useful to review, and, where appropriate, recommend improvements to existing environmental and technical standards to ensure our communities and the environment are protected. The Panel will assess the challenges that hydraulic fracturing activities may represent for social and physical environments. This should include assessing opportunities for minimizing/mitigating surface infrastructure development and associated impacts such as footprint, linear disturbances, vehicular traffic, dust, emissions, odours, noise and environmental impacts such as pollution, waste management and geological risks. The panel will assess the potential impacts on land as a result of hydraulic fracturing operations. This should include an assessment of potential risk for soil contamination from site development and from the storage and handling of additives, wastes and petroleum products. The panel will also review impacts to land from site development and transportation of chemicals to and from the site. What are the activities associated with hydraulic fracturing that can impact soil and land? What are the potential risks to soil and land from these activities? What actions/regulations/best practices can be applied to reduce the impact of hydraulic fracturing on soil and land? The Panel will assess the potential risks to the environment of current and available waste management technologies for treating fluids used in hydraulic fracturing and the associated outcomes. This assessment will include, but is not limited to, issues such as storage areas, deep well injection, and solid wastes. What types of fluids are used in modern hydraulic fracturing operations? What are the potential risks from using these types of fluids? How are these fluids treated after use and where can they be stored? What actions/regulations/best practices can be applied to manage fluids used in hydraulic fracturing operations? The Panel will assess the potential risks of additives used in hydraulic fracturing fluids, including the use of additives, potential environmental impacts, and the storage and handling of these additives. What types of fluid additives are used in modern hydraulic fracturing operations? What are the potential risks from using these types of fluid additives? How are these fluid additives treated after use and where can they be stored? What actions/regulations/best practices can be applied to manage fluid additives used in hydraulic fracturing operations? The Panel will assess the requisite regulatory requirements and best practices to ensure wells are drilled, completed, stimulated, produced, suspended and abandoned in a manner that assures wellbore integrity, considering the risks imposed by the unique reservoir characteristics of the play and the technologies being employed, such as inter-wellbore communications. What are the current regulatory requirements for well drilling and completion in Western Newfoundland? Are these regulations consistent with those in other Canadian jurisdictions? Is the geology of Western Newfoundland distinct from other areas where hydraulic fracturing operations are currently taking place to require different well drilling and completion rules? What actions, regulations and/or best practices can be applied to ensure wellbore integrity? The Panel will assess the potential geological risk associated with hydraulic fracturing operations, including induced seismicity. This may include wellbore placement and drilling design, procedures to monitor for induced seismicity and procedures to mitigate and respond to induced seismicity. Do hydraulic fracturing activities cause measurable seismic events that can impact communities? Is the geology of Western Newfoundland distinct from other areas with respect to the impact of hydraulic fracturing on seismicity? What actions/regulations/best practices can be applied to hydraulic fracturing activities to minimize seismicity and geological risks? The Panel will assess the regulatory oversight requirements for hydraulic fracturing operations. This would include regulations regarding how wells are drilled, completed, stimulated, produced, suspended and abandoned in a manner that assures wellbore integrity, considers the risks imposed by the unique reservoir characteristics of the play and the technologies being used (such as inter-wellbore communication). This review will also include the application and approval process, filing requirements and design of hydraulic fracturing operations, including the chemicals used. What are the regulatory oversight mechanisms in other Canadian jurisdictions where hydraulic fracturing operations occur? How does the current framework in Newfoundland and Labrador compare? What are the best practices to ensure appropriate oversight for hydraulic fracturing operations? Should there be ongoing environmental monitoring during and after hydraulic fracturing operations? What actions/regulations/best practices will ensure appropriate regulatory oversight and responsibility? The Panel will assess final site restoration requirements for hydraulic fracturing operations. This may include well decommissioning, removal of infrastructure, soil assessment, soil remediation, long-term monitoring and holding tank decommissioning. What are the risks to soil and water from completed hydraulic fracturing sites? What are the best practices to ensure that companies properly close their sites upon abandonment? What actions/regulations/best practices can be applied to hydraulic fracturing activities to ensure sites are properly restored? Various financial securities and insurances are required throughout the different phases of resource development. The Panel will assess the financial security requirements for hydraulic fracturing operations to ensure that they address the potential risks associated with hydraulic fracturing activities. What type of activities and risks should be covered under financial security and insurance? What are the long-term risks and how should they be mitigated or monitored? What are the long terms costs of environmental risks associated with hydraulic fracturing operations? What actions/regulations/best practices can be applied to hydraulic fracturing activities to ensure companies post the appropriate financial security and insurance? The Panel will assess the potential risks to air quality from hydraulic fracturing operations. This may include setting emissions limits, monitoring emissions from hydraulic fracturing operations and planning for emission reductions. What are the potential risks to air quality resulting from hydraulic fracturing operations? What limits on air emissions from hydraulic fracturing operations are imposed by other Canadian jurisdictions? What actions, regulations and/or best practices can be applied to hydraulic fracturing activities to reduce air emissions? The Panel will assess potential risks to public safety from hydraulic fracturing operations and associated emergency response planning needs. What are the public safety risks to communities from hydraulic fracturing operations? Is the emergency response infrastructure in Western Newfoundland sufficient to address the public safety risk from hydraulic fracturing operations? What actions, regulations and/or best practices can be applied to hydraulic fracturing activities to ensure public safety? The Panel will assess how to inform and involve the local communities and other stakeholders throughout the full life cycle of a project, from early exploration through to abandonment, to determine which issues are of particular concern and how they might be addressed. What best practices can be applied to ensure appropriate community engagement should hydraulic fracturing occur? Technology such as hydraulic fracturing has made it possible for many communities to benefit from economic gains due to the production of oil and gas, including employment opportunities, supply and service contracts and local infrastructure development. In addition to recognizing the economic benefits for local communities, care must be taken to minimize disruption during operations and consider social and environmental responsibilities to individuals and communities. What is the potential socio-economic impact from unconventional petroleum development involving hydraulic fracturing operations in Western Newfoundland? Release the Terms of Reference and other related research documents completed. Have the Panel provide an email address and standard mail address for general public responses and submissions. The Panel will also provide a feedback form. Have the Panel issue a news release that outlines the review process and announces a series of public review sessions held in Western Newfoundland. The Panel may request public comment on the scope and topic areas to determine whether additional information should be provided before convening the public sessions. Following the news release, the Panel will provide 90 day notice of the detailed schedule of the public review sessions. After the review, recommendations will be submitted to the Provincial Government via the Panel’s report.